Move up/down the picker wheel to select another calendar. The current date will be updated automatically. This table below provides information on the current date selected. Press this button to copy the current selection into the paste-board. You can then send a mail or create a note with the current date converted in all formats. Press this button to reinitialise the counter of days. 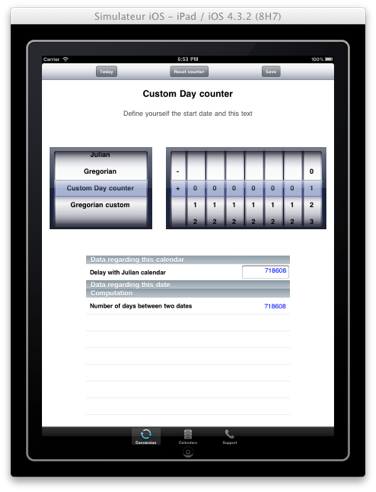 This counter computes the number of days between two dates of two different calendars. This information is displayed in the table below. 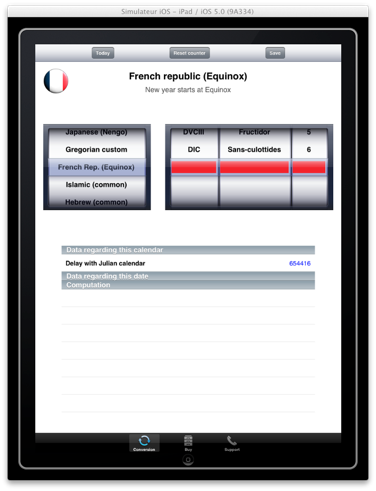 The icon of the application can be customised. 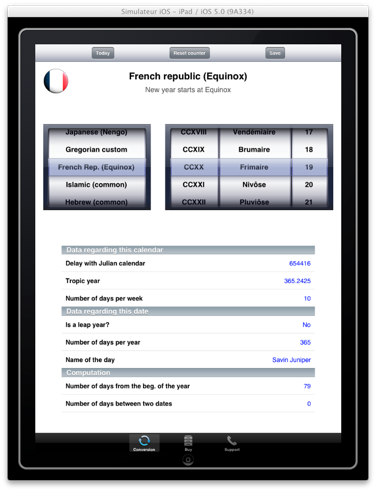 Currently three calendars can display information:. If this parameter is activated, the week number of today will be displayed. If a red bar appears when converting a date, the original date is out of range and cannot be converted. If you activate this setting, the application will select the today date when it will start. Otherwise, the last date selected will be displayed. Few calendar can be personalized with a specific start date. So you can have a calendar with your birth date as a starting date. In that case the 1st January 1 will be the first date corresponding to your birthday. Select the 1st of January 1 in the Julian calendar. Then reinitalize the day counter. This number must indicate 0. Select your birth day in the gregorian calendar or your native calendar. And remember the number indicated here. It is the number of days between the 1 January 1 in the Julian calendar and your date. Copy this number in the cell below into the new custom calendar. 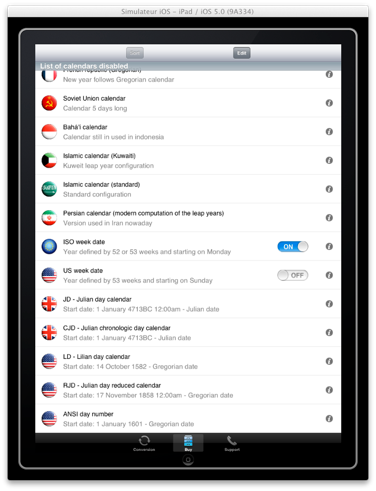 You can also configure the name of this calendar.